Oh! Lord! I wonder, like I call out your marvelous creations in one single word - "Universe", can I also find one to define you? Oh! How I can explain the depths you went down to pick me up, when I willfully in flesh took the path of destruction. 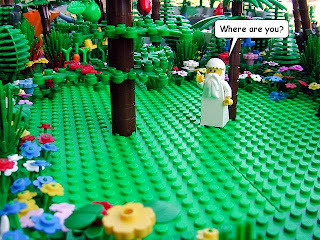 Or How can I explain that I let my LORD, the holiest of holy to walk thru that path of filth to find and pick me up. Great, Mighty, Wonderful, Magnificent, Amazing, Awesome, Incredible, Marvelous, Stupendous does any of the adjectives justify your glory, Oh LORD! Oh! LORD, this body I defiled for pleasure with all my six senses I submit at your feet as sacrifice. Oh! Father! A broken soul, A contrite heart,..A hopeless spirit is what I can offer, while I wasted away my goodness like the Prodigal son in past. I come with what I have, remnants of the pain of pleasures widely spent, products of the sins I possess. What use I will be of to you, Father! I maimed & mutilated myself in ignorance and in seek of worldly pleasure and approval. But Oh! Dear LORD, how I can explain the joy of my heart with your reply,..." Didn't I make the first man Adam from the Dust. You are more than dust for me to work with. My work in you is just stalled. It is not Over"
Oh! Father of everlasting mercies, thanks for sending your Son as my Bride groom. A Bridegroom with the Everlasting life. What an incredible profile Bride groom for a bride who brought rags & tears as her possession. Who is like you, LORD! Who is like you! My words fails me,...My Language limits me,... 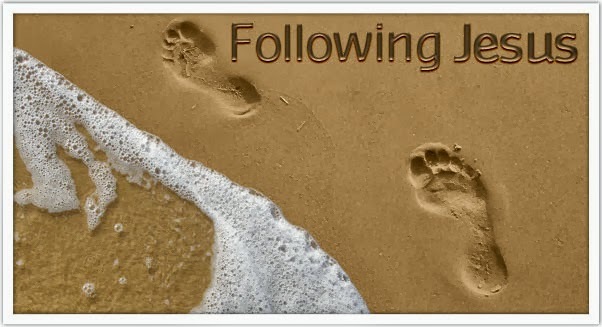 So Let my actions talk your glory in this sojourn until I see you face to face! 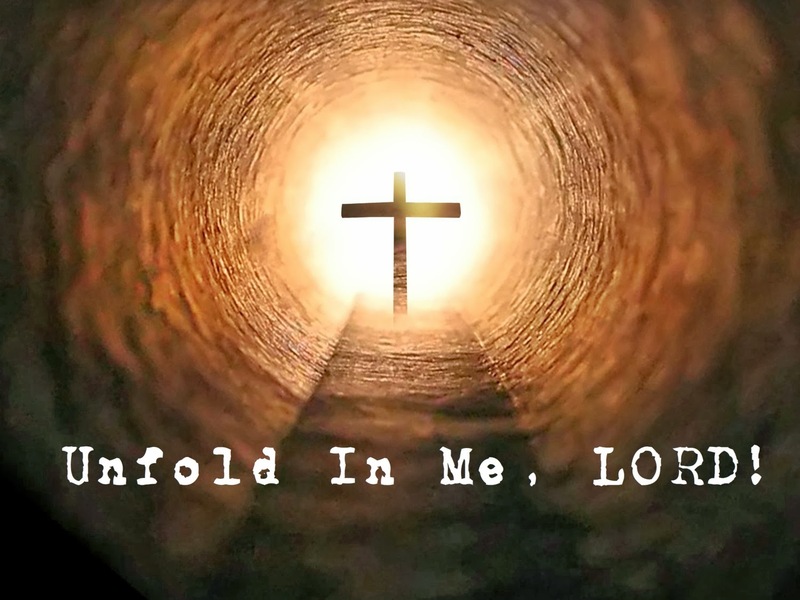 Unfold in me, LORD!…Yes…Unfold in Me! Few years back when I was given a tight slap on my face by the reality of the people I was associated with. I was deeply hurt to the point that went numb in all levels. It is a feeling that is worse to experience. All that you have believed and lived so far, go meaningless moment. So grave that I felt that I can do anything. Anything wild. I wanted to fly an aircraft and went around checked few flying clubs for membership details and fee information. Wanted to sky dive. I wanted to do something that people are generally scared of coz I felt it wouldn't matter anymore. I had enough of this life. I have become so dead inside. BTW, I couldn't do any of it because of the same association has let me into debts and penniless at that point. And all those dangerous sports cost good money. Then I took the most wildest event. The most adventurous trip. The incredible step. Yes, I heeded to the call of Christ. I remember that gloomy afternoon of April with severe thunder storm. I was stuck at a small town airport with my flight cancelled to New York city (which means I will miss my connecting flight from there). I was standing in customer service line to check for other Airlines for I really wanted to be at home that night. Smiling outside and hurting inside, suddenly my eyes welled with tears and I asked "How LORD? How did I let myself into this? How can I come out of this?" Then I heard a still voice inside my heart "PLEASE, Endure it for me. Please,..Please,.. Hang in there for me". I was stunned for a sec. What just happened. What did I hear? Is it Jesus? Is he really hearing to my wails? Didn't I do these mistakes? Am I not responsible for this situation of mine? Didn't I ignore the warning signs? Then, why he talks as if he made those mistakes? As the Bible says in Romans 8:1 There is then no condemnation to them that are in Christ Jesus. He surely made it easy for me. Every time I stumbled to take the next step, he was/is there by me, holding me, carrying me. Helping me like a mother tending a sick child. When the world mocked, joked, commented about my ignorance in dealing with those people, he was respecting and recognizing my wear and tears of my inside. Didn't the bible say when world sees the face, he sees our heart. He worked his way into me. He fulfilled my first desire of my heart by giving me strength to read the Bible. Then he fulfilled/fulfilling my desire for spiritually strong and bold people in life. When these two happened, my heart started to slowly gain life. My brain which went stiff as a paper started to work. He is the LORD that bring beauty out of ashes. Who is like HIM! Dear Friend, If you are in a situation or a circumstances that is leaving you lifeless. I encourage you to focus towards the living GOD than the lifeless circumstances around you. Didn't he say in John 7:38 that he is the Living water. Come who thirst for the water, drink from him. Let the living water gush out of you. There cannot be anything adventurous than the walk with HIM. There is nothing greater than HIS plans for us. There cannot be anything amusing than HIS miracles. Heed and Be Healed ! Amen! With the Foot ball season just has kicked off, cheer leaders and rooting fans for each team bring so much passion and power to the game. Have you wondered the Cheer leaders for Jesus? Well. I just had an opportunity to have a good look at one such Cheer leader this Sunday. As the Church celebrated Gospel music this week as the theme, though we were immersed into the joyful worship I still cant help but notice the "young lady" with golden pom pom singing and dancing her way thru the service. Her energy at this age tells pages of her walk, her life and faith in Christ. The LORD has shed that with my walk thru this past wilderness. If I cant dance and sing for him, then I have nothing to dance and sing about in this world. If don't dance and sing for him, then the rocks will cry out in my place. I am glad that the LORD took away that feeling. Bible says so much about singing. Bible does not say about Style of singing but it talks about Substance. It does not ask about the singer, but it asks about singing in spirit. 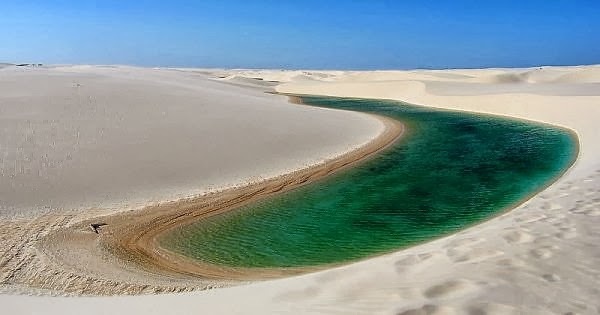 It does not say about the notes of song,..it says about the greatness of the LORD! It is not about the performance, it is about the Praising Christ Jesus! You could be awkward singer, So what. No Grammy can match to that song that comes from your spirit in praise of HIM. We belong to a Super Powerful Team. Come let us Cheer for our Coach, forerunner, the Awesome Quarter back, Our Prominent Center, Our Running back, Full back, cornerback, our Dependable defensive tackle/end, Our Safety. With HIM this game is ours! Praise the Mighty name of Jesus Christ! 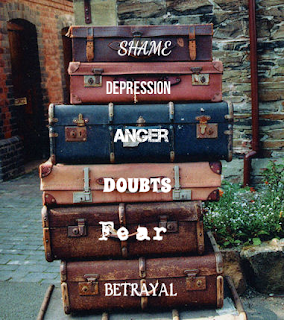 "Leave your baggage behind and move on! That's what I learnt… " - this morning in a lesser than a minute conversation, this phrase came from this friend I befriended in the train who months ago shared his bad experience in a business. Betrayed by his brother-in-law, after 3 yrs of hardworking in business with no wages but valuable experience comes this pearl of wisdom. This morning when I saw this friend after a long time, I shared the news with joy "Hey, I am out of my painful business partnership". He showed a great sense of excitement nodding "Very Good" and then that advice followed. Next second, we bid bye at the train station and split in the opposite direction while the message remained in me. I know it is the much awaited message for me for this morning. Many times we get so conditioned to the painful course of our life that the actual deliverance of the problem itself still leaves us with LESS or NO joy. Fear, Doubts, Frustration has become a norm of the life that the change has not taken effect yet. We carry that baggage of fear, doubts & worries with groaning and grumbling. We stare at the closed doors with the worry of it getting opened again. While there is this door, Not just a regular door,..but a door to the Elevator of this Blessing Building wide open waiting for you to enter. Then all the congregation lifted up their voices and cried, and the people wept that night. 2 All the sons of Israel grumbled against Moses and Aaron; and the whole congregation said to them, "Would that we had died in the land of Egypt! Or would that we had died in this wilderness! 3 Why is the Lord bringing us into this land, to fall by the sword? Our wives and our little ones will become plunder; would it not be better for us to return to Egypt?" 4 So they said to one another, "Let us appoint a leader and return to Egypt." How sad! The same Israelites who were crying day and night to get relieved from the slavery now wanted to go back to Egypt when the LORD has ordained a land flowing with honey and milk for them. When the Israelites packed to leave Egypt, they also packed with them their insecurity, fear, memories of whip lashes and doubts. They could not remember the 10 signs of miracles or the parting of red sea. Their judgment and faith is clouded. Today if you are in the new season of life, remember the LORD said has a new plan for you, new doors for you, new land of living. Dear Father, O LORD of heavenly lights! You give us good and perfect gift. You are a good GOD. We honor and praise you. Thanks for picking us from the pit. Thanks for raising our head amongst our adversaries. Thanks for your plans to prosper us. Thanks for listening to our prayers and delivering us. Like Job called out we declare "My Redeemer Liveth". We are more than conquerors. Nothing can separate us from your love. Last night before going to bed, My son was reading the Bible Comic. He showed the picture of the LORD, calling out Adam and Eve in the Garden of Eden. He asked me "Do you know why GOD is calling out and asking where are you?" Intrigued to know what he has to say I asked him "Why?" He replied "Because he wants them to come before GOD and tell the truth." I asked him how he knows this. He replied in a heartbeat "Remember GOD is powerful, HE knows EVERYTHING. He already know what they have done"
I know that LORD speak to us thru various mediums. Last night, I learnt a lesson for life on Prayer of Confession, repentance and forgiveness. We all have sinned. 1. We might still have sins in our life that is yet to be confessed. 2. Sins of very small order, a simple lie to an envy to own something you saw in the mall or at your friend's place. 3. But before we come before the LORD, it is important to bring that out to HIS eyes and ask for HIS forgiveness. Imagine a friend who has wronged behind your back against you and you know the complete details of it. Later, He comes to you and asks for you a favor. What you would do? Being in Christ, you would still love him and would probably do what he needs. But what is your state of mind. Will you able to take the friend's fake smiles and praises? No. In fact, it is more hurting to watch your friend's funny activities of affirmation than what he has done behind the back. Please know that every time, we cover our sins. We make HIM groan in pain. So Dear Friends, we should stop playing the hide and seek game with the LORD. HE is calling us Where are you? Every day Let us come out clean before him and ask for his forgiveness, grace and mercy. Great LORD will recognize our obedience and cloth us with HIS honor and glory! Praise the mighty name of Christ Jesus! From the reference words, we are going to meditate and highlight on the term "Prosper". These words of Promise and Comfort were spoken by our God to the Israelites, when they were about to leave the city of Babylon. God gave an assurance to the Israelites even though they were in tribulations. He had plans for them, plans to prosper and retain the goodness. Here, in our lives, we are into different tribulations and sufferings. But, as God promised to the Israelites, he is with us and comforts us with his words. Not only comforting and he gives us a good hope to prosper. Because he the God of compassion and mercy. We often do not know our own minds, but the Lord is never at an uncertainty. We sometimes fear that God's designs or plans are all against us and might lead in a different way, but as to his own people, even that which seems evil or temptation, is for good. Secondly, even when we come across the temptation the God gives us the capability and endurance as said in 1 Corinthians 10:13 No temptation has overtaken you except such as is common to man; but God is faithful, who will not allow you to be tempted beyond what you are able, but with the temptation will also make the way of escape, that you may be able to bear it. Our situations, health, struggles, problems may overcome us, but still we are able, so our God permit us to bear these tribulations and also makes a way to get rid of it. 10 And the Lord restored Job's losses when he prayed for his friends. Indeed the Lord gave Job twice as much as he had before. 12 Now the Lord blessed the latter days of Job more than his beginning; for he had fourteen thousand sheep, six thousand camels, one thousand yoke of oxen, and one thousand female donkeys. Dear Brothers and Sisters, Today, we might be into a hard situation like Job. 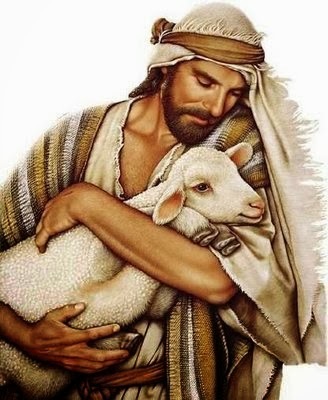 Our relatives may leave us, our friends may leave us but the unchanging and everlasting God Jesus Christ is with us. 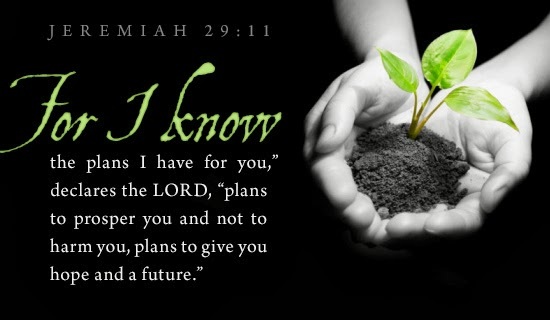 He has awesome plans for us. Our heavenly father knows our present conditions and keenly observes and gives us a good hope and future. The only thing we need to do is to have a complete faith on him. Whatever, our situations may be….. Do we have the faith that Job had in his life? God will give us, not the expectations of our fears, or the expectations of what we think, but the expectations of faith, the end he has promised and which will be the best for us. The Creator, Our God's plan is always to restore and prosper us. His Promise to us never fails. He blesses and satisfies us with the Goodness and Mercy. 1. Do you completely rely and depend on God, to execute his plan on you? 2. Do not dishearten, because God's promise never fails. 3. Submit your life to God, he will shape you and make you Prosper.